There are some simple, but important rules, when it comes to funeral etiquette. Upon the death of an intimate acquaintance or friend you should go at once to the house. If that is not possible, sending food is very much appreciated. Or you should write a letter to the family. For further help see How to Write A Sympathy Note. In either case, you send flowers addressed to the nearest relative. For further help see How To Select Appropriate Flowers for A Funeral. 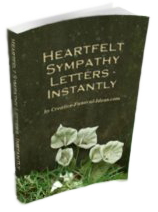 On the card accompanying the flowers, you write, "With sympathy," "With deepest sympathy," or "With heartfelt sympathy," or "With love and sympathy." If there is a notice in the papers "requesting no flowers be sent," you send them only if you are a very intimate friend. Or if you prefer, send a few flowers with a note, immediately after the funeral, to the member of the family who is particularly your friend. 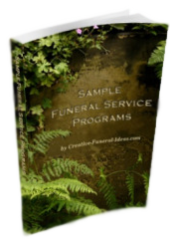 If the notice says "funeral private" you do not go unless you have received a message from the family that you are expected. 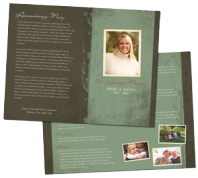 Where an obituary is published in the paper, it is always appreciated by the family, your showing sympathy by going to the funeral, even though you may have had little more than a visiting acquaintance with the family. It is proper sympathy etiquette to go to the funeral of one with whom you were associated in business or other interests, or where you are a friend of the immediate members of the family. You should wear black clothes if you have them, or if not, the darkest, the least conspicuous you possess. Enter the church or hall as quietly as possible, and if there are no ushers, seat yourself where you approximately belong. Only a very intimate friend should take a position far up on the center aisle. If you are merely an acquaintance you should sit inconspicuously in the rear somewhere, unless the funeral is very small and the church big, in which case you may sit on the end seat of the center aisle toward the back.